Lyme and Old Lyme both offer innumerable opportunities for walking, hiking and simply enjoying their Open Space. Saturday, Sept. 22, will be a day of double celebration since it is both the Autumn Equinox and National Public Lands Day. 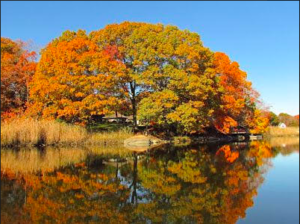 The Equinox officially marks the beginning of autumn in Connecticut, and for six months thereafter nights will be longer than days. National Public Lands Day (NPLD), held annually on the fourth Saturday in September, was established in 1994 to celebrate the connection between people and green space in their community, and to encourage use of open space for education, recreation, and general health. The seasonal change offers tremendous compensation. Fall’s crisper, cooler days are ideal for hiking and nature watching, and our local forests present a truly spectacular color show for leaf-peeping. The Old Lyme Open Space Commission invites you to enjoy the town’s 600 acres of public lands. Their publication Take a Hike provides a fascinating natural history overview of open space properties. “The Hartford Courant” also recently published a Peter Marteka column on caves within the Ames Family Preserve. Hiking maps can be found on the Open Space page on the Town of Old Lyme’s web site. In addition to town-owned open space property, the Old Lyme Land Trust owns over 1,000 acres of scenic, historic and ecologically important land in Old Lyme. Many of these properties have well-maintained hiking trails – descriptions, directions and hiking maps can be found on their website. Celebrate the Equinox and National Public Lands Day tomorrow, and into the fall, by visiting Old Lyme’s open space. Share your favorite outdoor activity Saturday on social media with the hashtag #NPLD.